Over the last three years, the TDP has been working with members of the Thames and Field Metal Detecting Society and the Society of Thames Mudlarks at sites across Greater London, including the Isle of Dogs and on the Tower Beach. Members of the societies collect artefacts from the Thames foreshore and record them with the Portable Antiquities scheme, and you can find out more about mudlarking in London here. In September 2010, I met John Higginbotham (also known as ‘Woolwich John’) at a T&F meeting when he brought along a lovely artefact from Rotherhithe to report to the PAS Finds Liaison Officer. John has continued to discover and record an amazing range of items, mostly from the City of London foreshore, searching both ‘eyes only’ and using a detector where permitted. Nick Stevens (also from T&F) has been photographing John’s finds and the slideshow below includes some fantastic artefacts including tokens, coins, buckles, cloth seals, children’s toys, keys, coin weights, a cosmetic set and four Anglo-Saxon strap ends. Enjoy! Please visit the gallery below to see more of John’s recent finds including a collection of silver coins, cloth seals, medals and lots more! 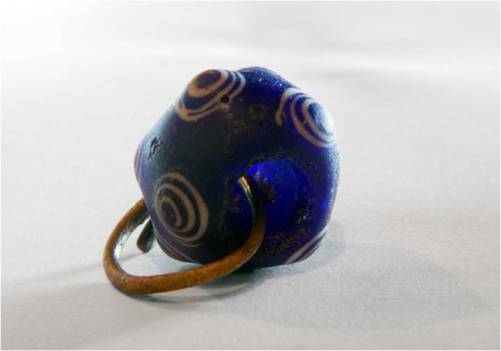 While working at the Tower of London last month, John mentioned another amazing find he’s made – a fantastic Iron Age bead – made of white and blue glass with a copper alloy ring. 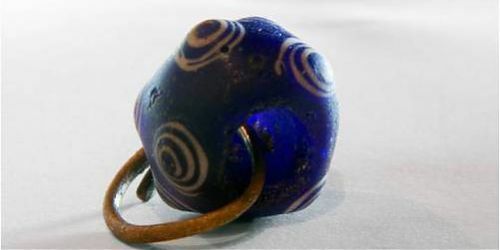 The wonderful image below is again from Nick Stevens, and you can read the Portable Antiquities Scheme report on this artefact here.